Kundalini yoga as taught by Yogi Bhajan is a safe and comprehensive system which combines breathing, stretching, movement, meditation and more for the experience of spirit and to heal your life. No experience in yoga is necessary for you to participate fully in this work. Everyone is welcome. * Overall health: strength and flexibility, enhancing your respiratory system and circulation, improving your digestion, strengthening your nervous system, invigorating your glandular system, building up your immune system and maintaining a youthful appearance. * Awakening the Spiritual Self: the experience of unity through yoga brings you into contact with your infinity, your link to the universe. If the scheduled group class times do not meet your needs, and/or you would like more individualized instruction, private classes are available. HarDarshan Kaur Khalsa, MA, LPC, Lead Teacher has been studying yoga for the past 35 years, including traditional hatha, Iyengar, Insight Meditation, and Bikram. In 1983, she discovered Kundalini Yoga and Meditation and knew that she was “home.” In 1985, after the births of her two children, she began teaching Kundalini, and was certified in 1987. For most of the past 30 years, she lived and taught in the Raleigh/Durham area of North Carolina, and founded the New Light Center yoga studio and healing center. 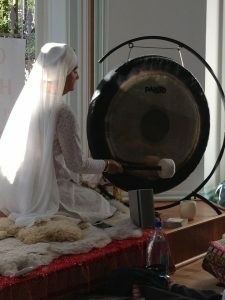 She moved to Boulder in 2003 and lived and taught at the Kundalini Yoga Center of Boulder ashram. She also taught Kundalini Yoga and Meditation techniques to cardiac and pulmonary rehab patients at the Health and Healing Center of Exempla Good Samaritan Medical Center, where she was a chaplain. HarDarshan’s classes are challenging yet heart centered, active and yet meditative. Come and experience these classes which lead you to the Heart of Healing!